It's another Wishful Wednesday and this week is a doozie!! I could afford this bag without putting a dent in my pocketbook! Wowzers! I would love to have that bag! The pink! The bow! The pleats! Oh geez, I get excited just looking at it! Head on over the Kelsey's and link up and share your 'I wish' bag! Cute, cute bags!! I never carry "colored" bags! The most I step out is a pale yellow or tan in the summer time! I know, soooo boring!! That Valentino bag is really snazzy and i would for sure carry! We should totally split the cost! Haha! Ummm that first one is GORGEOUS! Maybe they will make a knockoff or something in the near future or other companies will see how cute it is an make something similar! Love love love the CL one! Swoon. That Valentino bag is TDF!!! Happy Wednesday! We seem to have a similar weakness for bows and pink! Love the Valentino bag, I'm swooning! Seriously that Valentino is Precious! I just immediatly put that bad boy on my wish list on my phone! SO CUTE!!!!!! I LOVE the Valentino! One of my picks is V too. I love the bows. Great picks! 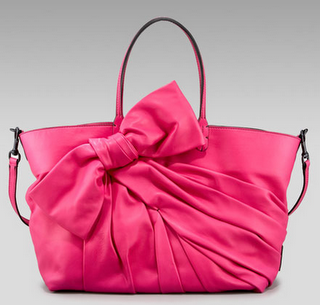 I completely adore Valentino's bags...the supple leather and bows are amazing!! Too bad I'd have to sell my first born to snag one! If I could get that Louboutin bag WITH a pair of the heels then I would be in heaven! :) Very cute! My mouth literally dropped open when I saw that pink bag! To die for. The price, not so much! Happy Wednesday to you, doll! I love the bow on the first one...so cute!! That Valentino is GORGEOUS! Between the color, the bow, I'm sold! I LOVE the bow! SO Julie! Both are super fun and totally unique bags -- get em'!!! the first bag is gah-orgeous!!! I like both of those bags! I found your blog on The Diva Bee! I'm a new follower, and maybe you can check mine out too!! LOVE the Valentino!!!! There are SO many that I would buy if money was NOT an object! Oh, I adore that first bag. She's so pretty!